Hooray! 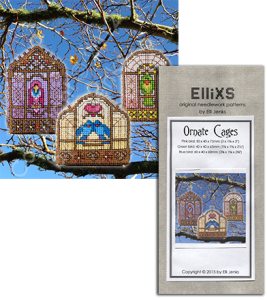 Finally my Ornate Cages scissor fobs pattern is ready to go. The reason I designed these was to use them as scissor fobs because I was losing my scissors (down the sides of chairs, into kitchen drawers, into black holes . . .) too often. I think I might attach one to my handbag though, and maybe next December I’ll hang them from the tree. This entry was posted in ElliXS on February 28, 2016 by Elli Jenks.